Organic Agriculture Without the Soil? For years, producers fought for a federal standard for organic to preserve integrity in the label. As a part of the Organic Food Production Act, Congress created the National Organic Standards Board (NOSB) to assist in the development of standards for substances to be used in organic production and to advise the Secretary on any other aspects of the National Organic Program (NOP). The NOSB is comprised of farmers, handlers, retailers, conservationists, consumers, and others with expertise in different aspects of the organic program. Last week, the NOSB held their second meeting of 2015 to discuss substances on the National List of Allowed and Prohibited Substances and other issues in the NOP, and to receive input from the public. These meetings are rarely free from some controversy, and this year’s meeting was no different. 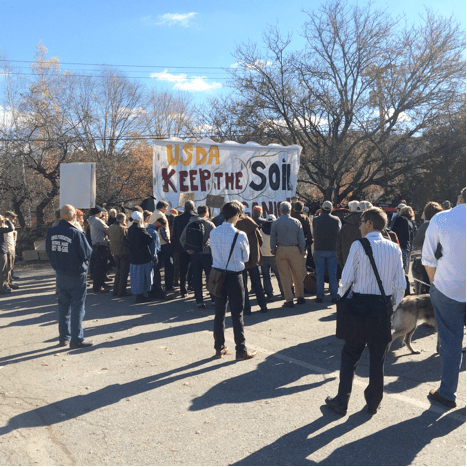 Outside of the meeting, farmers brought tractors to protest the continued certification of hydroponic plants (plants grown using mineral nutrient solutions without soil) as organic. Since that time, some certifiers across the country have continued to certify hydroponic operations as organic. Hydroponics can have advantages for both farmers and consumers. Hydroponics expand growing seasons and make local produce available in seasons when it might not otherwise be available. Yet, when consumers think of organic produce, do they think about crops grown in a nutrient solution? A key purpose of the Organic Foods Production Act was to assure consumers that organically produced products meet a consistent standard. To assess in greater detail hydroponic and aquaponic operations, NOP put forward a call for a task force to inform the NOSB on the status of the industry of hydroponics, including what kinds of practices should or should not be included in the standards. NOP appointed 16 members to the task force. National Farmers Union policy does not explicitly specify whether or not hydroponic should be included in organic certification, but NFU members have included strong, grassroots-driven policy on the role of the NOSB. NFU policy states, “We support requiring USDA to maintain the role of the National Organic Standards Board as the official source of developing policies and procedures to interpret and implement the federal organic standards.” NFU members also view organic farming as aiming to achieve a balance in the agricultural and livestock system similar to that found in natural systems. NFU will monitor the efforts of the task force and will work to ensure that the role of the NOSB is preserved. Editor’s Note: Are you interested in serving on the NOSB? Several spots open up next year, so sign up for updates from National Farmers Union to keep up-to-date on the nomination process.